Our first brewery was a 7bbl system located in our downtown Corvallis brewpub. It's still in use today for small batch brews, enabling our brewers to experiment with one-offs and variations in addition to brewing up many of our pub series beers. Though the mash tun and brew kettle reside in the upstairs restaurant, most of the brewery is divided into two separate infrastructures woven throughout the pub's basement—one dedicated to our wild & sour program, and the other dedicated to brewing traditional ales and lagers. Each contains separate fermenters, kegs, and aging barrels. Our pub brewhouse helped build Block 15 into what it is today. At its peak, this little powerhouse has cranked out as much as 1,200 barrels of craft beer per year. Our brewpub's main fermentation room is situated directly under our restaurant. As you enjoy our tasty pub fare, a batch of Aboriginale or Ridgeback Red is likely bubbling away just feet beneath your seat, alongside barrels quietly maturing various strong ales. The heart of our wild & sour program, our wild cellars nearly operate like a separate brewery, with rigorous procedures in place to prevent wild yeast and bacteria from escaping into the rest of the brewery. Winding underground all the way to the alley, our two wild cellars feature over 100 barrels, a cool ship, and packaging equipment. Our 20bbl production brewery, built in 2015 and located in the shadow of the coastal range in south Corvallis, is the workhorse of our brewing operations. In addition to an increased-capacity brewhouse, our production brewery houses custom-designed Uni-tanks, a custom-fabricated mixing tank, a Meheen bottling line, and a Cask canning line. 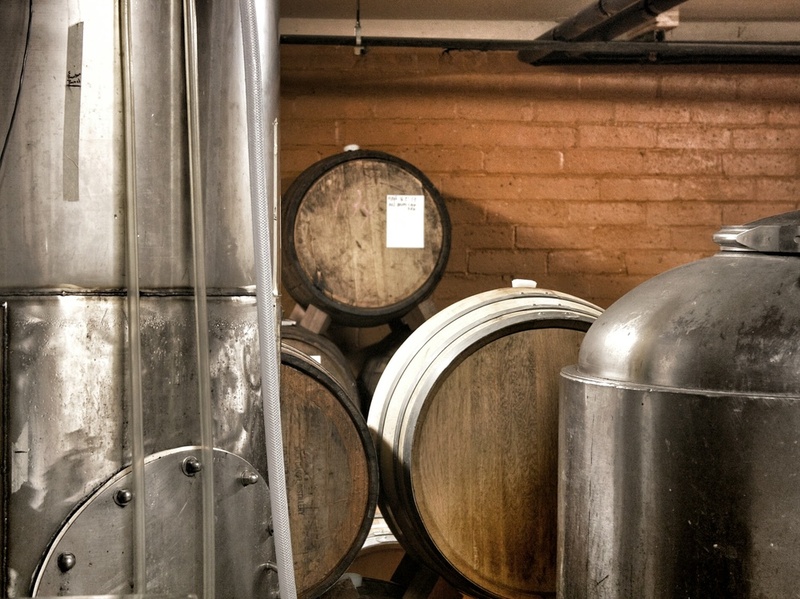 This brewery is also home to a temperature-controlled barrel room, which houses bourbon, Scotch whisky, cognac and brandy barrels filled with beers such as Super Nebula, Figgy Pudding, and Hypnosis. Want to check out our facility in person? Feel free to stop by when our Tap Room is open, grab a pint and sandwich, and watch our brewer's working hard on the beer you love! Our Meheen bottling line, which we use for packaging our Seasonal Bottle Conditioned Series as well as bottled special releases like Super Nebula, Imagine, Figgy Pudding and more. We opt for our Cask canner for beers designed to be packaged, distributed, and consumed freshy fresh—generally hop-forward beers like Sticky Hands, as well as one-off releases like Board Shorts and Intergalactic Hop Shop. We designed this mixing tank specially for our bottle-conditioned beers. By thoroughly mixing our conditioning additions—typically yeast and sugar or honey—into the beer just before packaging, we're able to evenly condition beers throughout a bottling run. This rustic technique for carbonating increases mouthfeel and aids in keeping the beer longer. Beginning in 2008 with a single French Oak Pinot Noir barrel, our passion for barrel maturing beer has blossomed into one of the Pacific Northwest's most unique barrel programs. With a collection of over 180 (and growing!) barrels, this program includes bourbon, brandy, cognac, wine, rum, whiskey, and Oregon oak barrels. These wooden vessels contain mysteries that are a challenge to unlock, infusing complex character into our beer. Popular Block 15 beers from our traditional barrel maturation program include Figgy Pudding, Imagine, Super Nebula, Sweet Sassy Molassy, and Hypnosis. In addition to our traditional barrel-maturing program, we also produce wild and sour beer, cooled and spontaneously inoculated in our custom-fabricated coolship (the first to be installed in the Pacific Northwest). This program is inspired by the great lambic beers of Belgium, and it's built in cooperation with the thriving population of house microorganisms found in our brewpub's wild cellar. After cooling and initial fermentation in the coolship, this beer is also aged in barrels—in this case alive with yeast and bacteria famous for producing complex and delicious wild beers, like lactobacillus, brettanomyces, and pediococcus. Beers from this program include Turbulent Consequence, 100% Gangster, Snozzberry, Kriek, Cardinal Coalescence, Golden Canary, and variants of Framboise. Our custom-fabricated coolship, installed in 2011. Part of our wild cellar, located in our brewpub basement.